You want me to write networking emails? Why would anyone possibly want to talk to ME? My heart ached earlier this week when I heard someone say this. This person is thinking hard about what’s next in her career and life. She’s trying to decide whether she can stay where she is and reshape her current environment—or whether it’s time to move on. This is no shrinking violet, either. She’s confident, and well-equipped to hold her own in conversations. But she’s getting in her own damn way. If someone really needed us in their workplace, they’d find us. They’d post a job and our resume would magically be the answer. Our fans and existing contacts will advocate and sell us in. If a change was meant to be, it should be obvious. And if that doesn’t happen, it must mean we’re not good enough, accomplished enough, or worthy of a better job or life. Here’s a surprise to some: career growth is all about people. And some of them are currently strangers to you. Opportunities & insights don’t fall from the living room ceiling, no matter how many inspirational magazines or books you read. So you’ve GOT to learn to connect and stay connected—otherwise known as networking. And one of the easiest places to start is by writing short networking emails. I answer a lot of those questions in my free planning guide, “How to Network While You Work.” Click here to download it. In this post, let’s get super practical to help my friend above, who down deep knows there are a few people who could be helpful at this phase in her career considerations. But she’s chickening out to engage them because she’s not sure what to say. I’ve written the emails for you here. So no excuses. This is the networking email you send directly to the person you’d like to talk to further. It could be a person in another part of your current company, a past boss (or someone who didn’t hire you), or a person working at a company you’re interested in, even if they’re not connected to any hiring. This email assumes you have some level of connection, even if it’s a small one. If there’s absolutely no connection, go to email 3. Finally, just like your GPS says, use your judgement. Make sure it sounds like you and makes sense as you add in the parts that are specific to the person, and to you. But don’t wait for perfection. Start connecting now. SUBJECT: Hello, and could we reconnect? Would you be open to a short conversation with me to share your perspective and ideas? I’d be happy to [come to your office, meet you for breakfast, schedule a call] at your convenience. Plus, it’d be great to reconnect and hear more about what’s happening for you. Let me know if you’d be willing, and we’ll get something scheduled. Thanks for your consideration, and I hope to talk to you in person soon! [YOUR EMAIL SIGNATURE: make sure it includes your phone number and link to your LinkedIn profile if it doesn’t already. If it doesn’t, set that up in your settings immediately.]. It’s inevitable that busy people have busy email boxes. And emails get lost. Happens to me, happens to you. But don’t assume no response = no. If you don’t hear back after a week, follow-up. And then follow-up again after another week. Remember, the people you want to connect with are busy adults with lives. And as adults, they have the free will to say yes or no to your inquiry. Keep asking until you either don’t need them or hear an answer. Here’s the email you can use. SUBJECT: Following up; willing to reconnect? Hi [NAME]! I hope this finds you well. I just wanted to check in again and see if you’d be willing to get a conversation on the calendar to reconnect. As I mentioned in my note of [DATE], I know your ideas and insights will be helpful as I think about what’s next for me, and I’d value reconnecting with you. Let me know what can work for you. Thanks again! Perhaps you have someone in mind specifically you’d like to meet, and you know from LinkedIn that I know that person. Or, you have a company you’re interested in, and I know people working at that company. Someone like me can connect you to your target. But you have to ask. Here’s the email you can use. SUBJECT: Willing to make an introduction? I thought you may know people who fit those categories who you’d recommend I get to know. Also, I took a look at your profile on LinkedIn and see that you’re connected to [specific names and their companies]. Would you be open to introducing me to one or two of those people? I’d really appreciate your help or any other ideas you may have for me. If it’s easier for us to talk live, let me know and we’ll set up a time to talk. I know you’re busy and appreciate any help you can offer. Thanks again! So there. 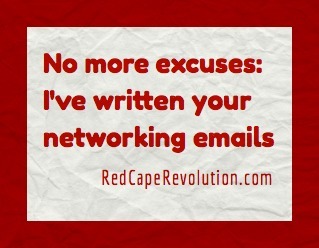 I’ve written the first networking emails for you so you can get started. Now go connect! YOUR TURN: What’s holding you back from asking for networking opportunities? Tell us below in the Comments or email us. Your questions often turn into future articles, so don’t hold back! LIKE THIS POST? Click here to subscribe to our twice-monthly career & success ezine and get more great ideas to create clarity, build confidence, and take control of your career.